REDUCED $25,000 for quick sale. Owner wants contract now! REDUCED $25,000 for quick sale. Renovations are completed. Oversized Bi-level home offers fully built out lower level plus attached, 2 car garage with no lolly columns...makes a great workshop too. Set up for in-law suite or home/office with two of everything. Washer/dryer upstairs and down. Extra room on lower level can make a sewing room or studio with egress to paving stone patio. Private yard all year round with seasonal, scenic views. Complete renovation in 2007...just painted upper level and oak floors were refinished, deck refinished etc... Wood kitchens have granite counters. Bright & sunny house. Separate entrances to lower level from driveway and rear yard. 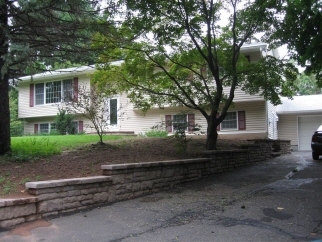 Paving stone front walk, treed property & top-rated schools in Woodglen Elementary/Clarkstown district. Large, neighborhood offers many safe streets for walking or biking. Easy access now that tenant is out. Double appliances, two laundry areas...one on each level. Whirlpool tub, pedestal sink, wood floors and much more. A very special, private yard with seasonal panoramic views..